There is no escape from Terry Johnson. The other day, I was leafing through a book of photos, and there was a young woman with a tattoo that read, “Just shoot me now… Don’t take me to Fort Smith” – a reference to the historic seat of judgment for outlaws in Arkansas. I instantly, helplessly, thought of Terry. He lived in Fort Smith and would have loved that tattoo. And he’d love it that the tattoo brought him to mind, again. He’s been gone for a couple of years now, and I think of him every day. Daily is how often we communicated, and some days it was hourly. He was the best friend I ever had who I never met. Our years together were an ongoing discovery of our similarities. Same age, same kind of upbringing, and an almost endless list of shared interests, likes and dislikes. On one of the rare occasions when I called him, I got his answering machine, which informed me that I had reached the home of Xontar, King of the Pig People. 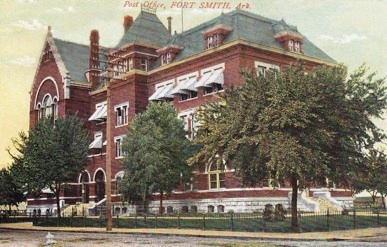 Mostly it was email and snail mail, like a postcard of the Fort Smith post office that I found for him. He loved that. Terry had many loves. He loved to bewilder waitresses, and then leave a huge tip. He loved to pull into a toll booth and pay the toll for the car that was behind him. He loved standing in line at the grocery store, because there were so many stories there. During his working life, he loved to take his dog, Kong, to company picnics so children could pat the big boy on the head. At his office, he built an Elvis shrine where his co-workers could worship. Yes, he was, in the most amazing ways. He was the master of guerilla generosity. At the homes of his friends, packages would arrive unbidden, containing novelties from Archie McPhee, the retailer best known for the rubber chicken. At Christmas, you might receive a spiral-cut ham from Nueske’s of Wisconsin or a royal assortment of macadamia nuts from Hawaii. Or a glossy calendar of medical oddities from a medical museum. He sent me a CD player that could hold 200 discs; he told me he got a deal when he bought three. One summer, it was a gazing ball for our garden; he said he wanted to triangulate three gazing balls using his new GPS. Also for the yard, a squirrel feeder. Out of left field came a postcard of a Bulgarian actress, circa 1910. One sunset, Terry found himself in Key West, listening to a street musician, a harpist named Andrea Stern. He didn’t just tell me how good she was; he sent me her CD. I was only one of many who received such unexpected items. 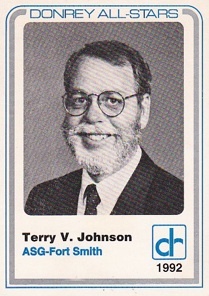 And when Terry got good service from a mail-order company, he would ask for the salesperson’s name and follow up with a letter to his or her supervisor telling them what a good employee they were. He loved to catch people doing something right. Not everyone understood him. A college grad with a degree in journalism, he would fume when he saw misspelled words on the screen during the local TV newscast. He took to writing down the mistakes, which were legion, and then calling the woman responsible with his corrections. Rather than invest a few minutes every day in proofreading, she had Terry arrested for harassment. The police came in the morning and took him to jail in his pajamas. I believe his court appearance was the last time he wore a suit, shaved, or had a haircut. He’d had enough. He’d had other run-ins with municipal officials. Terry saw his front lawn as a forest, while his neighbors were hoping for something more like a putting green. It was probably even more galling because Terry had a Ferrari in the driveway. Once an official gave him a hard time about a fallen tree; I suggested he tell her it was a “nursery log.” He loved that. He loved his friends. He loved his dogs. He loved to sail. He loved to tell stories, and hear stories. And you could tell Terry anything. 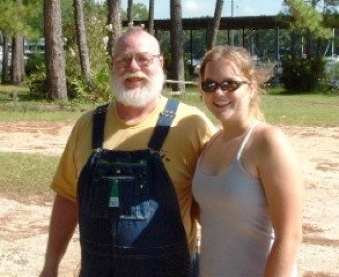 He was the least judgmental person I’ve ever known. He was a joy, an inspiration, a mentor, comic relief, a deep well of compassion, a gentle man and a gentleman, the best kind of friend. Faced with health problems, weary of doing battle with society, Terry just let go. He was found sitting at his kitchen table, his three adopted dogs at his feet, not wanting to leave him even though he had grown cold. Everywhere I look, I see reminders of his generous spirit. God, I miss him. The woman with the Fort Smith tattoo is singer Sarah Silva, a native of Fort Smith; the photo was taken by Josh Marx. For the Donrey “baseball card” I am indebted to another of Terry’s friends, Denise Ruggeri, who sent the card to me. The photo just above came from Terry after a sailing trip; the young lady with Terry is Kat, and Terry told me that she did the stern of her sailboat in decoupage. He said it was quite wonderful.